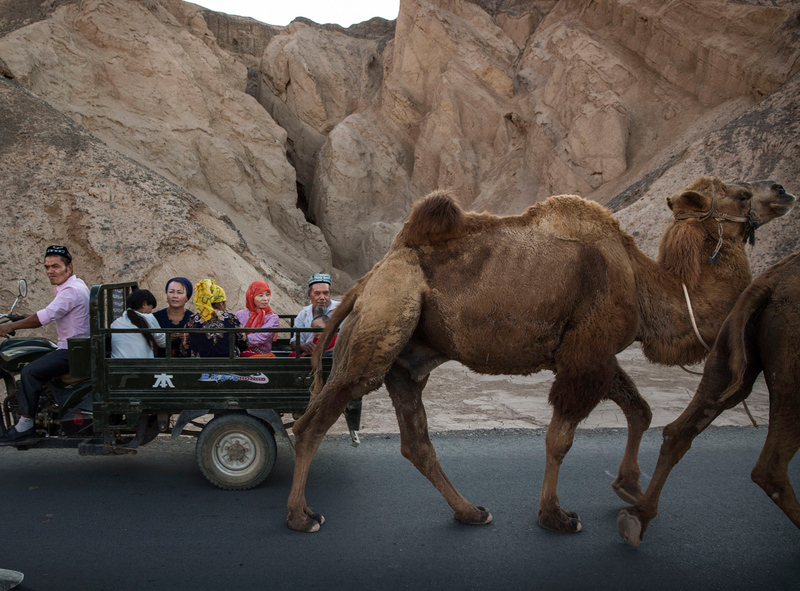 A Uighur family drives past camels in Turpan County, Xinjiang, September 12, 2016. The Silk Road Economic Belt—the overland component of Xi Jinping’s signature Belt and Road Initiative (BRI)—promises to bind China to Central Asia and beyond through a new infrastructural network. Connecting through China’s far western Xinjiang Uighur Autonomous Region, the belt, alongside a network of pipelines and highways constructed since the early 2000s, is part of a larger effort to stake a Chinese claim to the resource wealth of Central Asia. This effort is only the most recent in more than a century of campaigns undertaken by an assortment of regional actors seeking to bind Xinjiang and all of Central Asia into a single resource production region. Agents of the Russian Empire and later the Soviet Union were particularly aggressive in their attempts to assert control over the resource wealth of Xinjiang in the first half of the 20th century. Soviet investments in surveys, extraction and processing equipment, and transport infrastructure at a handful of sites in northern Xinjiang helped create a blueprint for state investment and economic planning that has been carefully followed by multiple generations of Chinese planners. The most recent campaign, undertaken by Chinese planners over the past two decades and which has culminated with the BRI, has helped steer a steady flow of the region’s petroleum and natural gas to industrial centers in central and eastern China. But the growing wave of Chinese capital has also helped create stark economic inequalities in Xinjiang. The gap between north and south, indigenous Turkic-Muslim Uighurs and immigrant Han, has helped exacerbate ethno-cultural tensions in the region. Eager to protect their growing investment in an integrated Central Asian production region, Chinese officials have constructed a new network of government-operated detention centers that today imprison up to one million Turkic Muslims. Goods produced in Xinjiang have long shaped the region’s connections to China and Central Asia. Historically, nomadic confederations sought to use the rich steppe land of northern Xinjiang as pastureland for horses while at the same time seeking to control the grain and agricultural products produced in the oases of the south. Fear of these confederations and their power prompted the Han Dynasty (206 BCE-220 CE) to first conquer the so-called “Western Regions” (Xiyu). Over the subsequent two millennia, the region’s connections to a succession of China-based regimes waned as often as it waxed. In 1759, armies of the Qing dynasty conquered this “New Frontier” (which is the meaning of “Xinjiang” in Chinese) seizing it from a Mongol regime that appeared to threaten the Qing’s domain. By the late 19th century, Qing power in Xinjiang was ebbing, as a punishing fiscal and political crisis opened the door for outside powers to try and stake their own claim to the region’s products. Rather than Mongols in pursuit of rich pastureland, however, it was foreign explorers seeking high-value pastoral products like camel hair and fetal lamb pelts, as well as an assortment of other natural resources including gold and petroleum. Facing financial and political challenges that would continue well after the collapse of the Qing dynasty and the establishment of the Chinese Republic in 1912, officials in Beijing did little to stem the tide of foreign explorers in Xinjiang. Benefitting from easy overland connections that bound Russian Central Asia to this province of China, explorers from Russia and, later, the Soviet Union flooded the region and confirmed long whispered rumors about gold nuggets as big as a pigeon egg and patches of steppe where bubbling crude collected in sticky black pools. The Qing Empire and Chinese Republic failed in multiple attempts in the early 20th century to come up with the funds to construct their own integrated rail or highway link binding Xinjiang to the rest of China. By contrast, Russian and Soviet explorers, as well as the geologists, engineers, and state planners who followed in their wake, benefitted from the construction of a Central Asian infrastructural network. After the completion of the Turkestan-Siberia Line in 1929, the Soviet rail network surrounded Xinjiang on three sides. The network not only helped transport Soviet planners and geologists eager to pinpoint the region’s resources, but also served as the conduit through which large quantities of Soviet-manufactured goods flooded into Xinjiang in exchange for local products. The Trans-Caspian, Trans-Siberian, and Turkestan-Siberia (Turk-Sib) rail lines. The lack of an integrated infrastructural network connecting Xinjiang to the rest of China, as well as the weak political oversight asserted by the early Republic of China (ROC), allowed provincial officials, all of whom were Han Chinese, a significant amount of autonomy. Facing a political and economic crisis in the 1930s, these officials were willing to sacrifice some measure of their autonomy for the financial and military support they needed to stabilize their control over the region. The Chinese government, which was facing its own challenges farther east, didn’t offer much support. So in 1934, officials in Xinjiang reached out to their deep-pocketed neighbors to the west for support. In a series of agreements with the Soviet Union, Xinjiang officials swapped favorable trade policies and access to the province’s tungsten, beryllium, and petroleum for Soviet loans, military support, and access to an on-going supply of manufactured goods. Eager to stake a lasting claim to the resources needed to meet ambitious industrialization targets in the 1930s, Soviet planners invested heavily in a handful of sites in northern Xinjiang located close to major border crossings, including petroleum at Dushanzi, tungsten and tin at Bortala in western Xinjiang, and beryllium and other rare non-ferrous metals at Koktokay in the far north in the Altay Mountains. 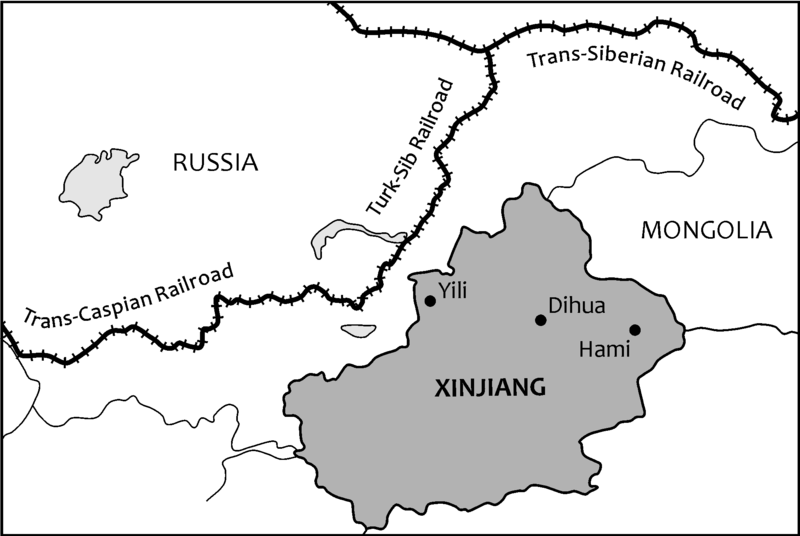 Even as they continued to insist that Xinjiang remained a province of the Chinese Republic, Soviet officials improved the connections binding border crossings to the Soviet rail network, and wrote clauses into the various agreements mandating that substantial portions of the loans must be devoted toward improving infrastructural networks connecting the resource sites to the Soviet Union. After nearly a decade, the relationship between Xinjiang officials and the Soviet Union collapsed in 1942 following the German invasion of Russia and a commensurate slow-down in Soviet aid to the province. Eager to roll back the Soviet position in Xinjiang and orient it more clearly to the east, officials in the capital of Dihua (present-day Urumqi) invited Chinese planners to tour the region in 1942. But the material presence of the Soviet highway networks, drilling rigs, and refining operations had a power that continued to resonate. Faced with the challenges of fighting Japan in World War II and a severe lack of capital, Chinese officials were unable to undertake a large-scale infrastructural development campaign and largely relied on Soviet plans and existing infrastructure. Later, when a Soviet-sponsored rebellion by indigenous Turkic Muslims carved off three of Xinjiang’s most resource-rich northern districts and formed the short-lived independent East Turkestan Republic (E.T.R.) in 1944, the new regime also relied on Soviet blueprints and swapped resources for Soviet aid and cash. The on-going power of Soviet investments continued following the collapse of the Republic of China, the dissolution of the E.T.R., and the victory of the Chinese Communist Party (C.C.P.) in 1949. The C.C.P. was able to extend direct political control over Xinjiang, but the resonances of the Soviet legacy continued. Soviet technicians, geologists, and engineers, many of whom had more than a decade of experience in Xinjiang, continued to play a critical role in petroleum and nonferrous metal production operations in the region. Eager to quickly ramp up production of petroleum and other resources needed by the People’s Republic, Xinjiang’s new communist leaders adhered to the larger blueprints identified by Soviet planners in the 1930s and 1940s. Soviet personnel and plans continued to shape operations even after the deterioration of Sino-Soviet relations in the late 1950s. Relations collapsed in 1960, and after one final shipment of nonferrous metal ore in 1965, which was used to complete payments on a Soviet loan, officials closed the border in Xinjiang. The closure abruptly severed the infrastructural connections that had helped create a unified, Central Asian production region. Growing fears about a border clash, alongside the discovery of new resource production sites in Manchuria, helped orient C.C.P. planning away from Xinjiang. After completing the Lanzhou-Xinjiang railway, which connected Xinjiang to China’s national rail network in 1962, Chinese planners scaled back their ambitions and shelved various plans for the construction of a comprehensive infrastructural and extraction network in China’s far west. Instead, throughout the Mao era and well into the post-1978 Reform Period, they largely followed Soviet blueprints and reinforced the investments in roads, refineries, pipelines, and extractive operations first made by the Soviet Union in the 1930s and 1940s. China’s demand for petroleum and petroleum products has increased steadily since the 1990s. And this growing demand has helped expand the map of oil fields in Xinjiang being prioritized by the state. But those sites in northern Xinjiang shaped by Soviet interest and plans, which were supported by nearly a century of surveys, infrastructure, and communities that sprouted up alongside of them, have retained their importance in Party economic planning in the region. These sites sit at the center of a resurrected Central Asian production network that stretches east toward the China coast. Oil pipelines connecting Xinjiang to Eastern China and Eurasia. Source: PetroChina. The oil refinery of Dushanzi, which was constructed with Soviet capital in 1939, is now at the center of an expanding pipeline network that draws in raw crude from not only Xinjiang, but also from fields located across the border in Kazakhstan. The pipelines, which are kept full by a series of agreements signed between China and the government of Kazakhstan in the early 2000s, resemble the earlier agreements signed by Xinjiang and the Soviet Union, but in reverse: offering Chinese loans in exchange for shipments of raw crude extracted from the Kashagan oil field in Kazakhstan. 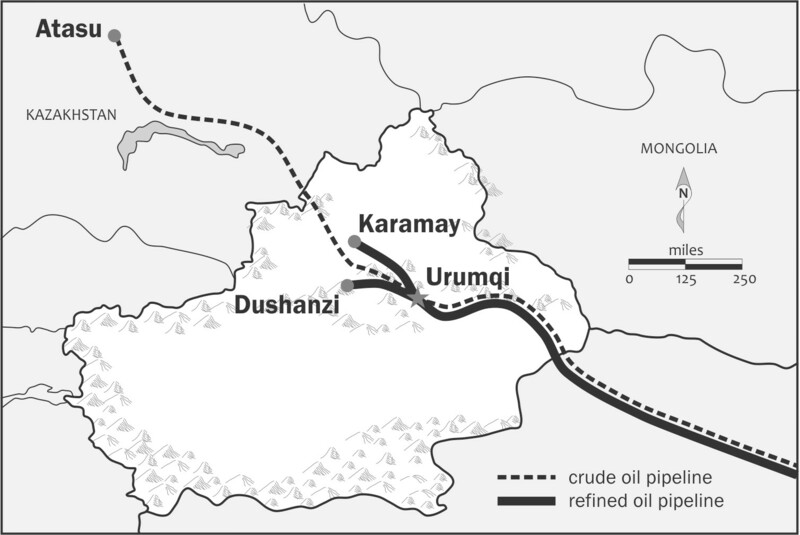 Today, Dushanzi is a critical node in China’s larger fossil fuel infrastructure, as it draws in petroleum from across Central Asia and redirects it via pipeline to industrial centers in eastern and central China. The flood of state investment into Dushanzi and other resource-production sites in northern Xinjiang has helped exacerbate ethno-cultural tensions between indigenous Turkic-Muslim Uighurs and Han Chinese. The state investments and the high-wage employment opportunities that these operations bring with them have helped create and exacerbate stark socio-economic inequalities in Xinjiang. Since the 1990s, a yawning socio-economic gap has only grown between the northern half of the region, first prioritized for development by Soviet planners and populated largely by Han who immigrated to the region in the 20th century, and the south, a region largely left off of the itineraries of Soviet geologists and state planners, and which is made up primarily of indigenous Uighurs. According to official data from the early 2000s, per capita GDP and wages in Karamay city (an administrative region that includes not only the major oil field of Karamay but also the district of Dushanzi and its refinery) is on par with major metropolises on China’s wealthy coast. The south, on the other hand, is home to counties that rank among China’s poorest. While the increasing demands for petroleum have led to a growth in oil and natural gas operations in the south, these operations, which rely heavily on immigrant Han labor and remain largely closed off from surrounding communities, have almost certainly done little to alleviate the problems of inequality. Turkic Muslim anger and frustrations in Xinjiang is by no means solely a product of socio-economic inequality. But the inequalities brought into relief with Xinjiang’s oil boom fueled a growing frustration and occasional acts of violence in the 1990s among Uighurs, who felt that they were being permanently left behind in their own land. A group of C.C.P. planners in the early 2000s recognized the negative impact of the unequal distribution of state resources in Xinjiang and its role in fomenting unrest. In addition to a series of aggressive “strike hard” campaigns that sought to root out Uighur separatism, beginning in 2001 with the Great Open the West Campaign (Xibu Dakaifa), Party leaders implemented policies in Xinjiang that sought to spread state investment more widely. Despite these efforts, which some scholars have noted were ineffectively implemented, the region was rocked by a series of violent clashes in the capital city of Urumqi on July 5, 2009. A handful of smaller, more localized incidents also made headlines in the years immediately after 2009. As part of the media campaign surrounding the Silk Road Economic Belt, China’s leaders are now advancing a mythical vision of a silk road defined by “peace and cooperation, openness and inclusiveness, mutual learning and mutual benefit.” It is a picture of the region belied both by Xinjiang’s Soviet-tilting past and by its repressive present. But for now, it has helped keep the pipelines open and the mineral wealth of Central Asia flowing east toward Beijing.